The Java substring Method is one of the Java String Method which is used to extract the part of a string and return in new string. In this article we will show you, How to use String Substring in Java Programming language with example. Before we get into the example, the basic syntax of the string.substring in Java Programming language is as shown below. The Java Programming Language provides two different methods to extract the part of a string. Following method will accept the integer value that is the starting index position where the extraction will start as the argument and extend to the end of the string. Following method will accept the integer value that is the starting index position (Starting_index) where the extraction will start as the as the first parameter and last index position (End_index) where the substring will end as the second argument. The Java String.substring method will return the substring starting from the Starting_index to End_index. Starting_Index: Please specify the starting index position. This is the index position where the extraction will start. End_Index: Please specify the ending index position. If you specify this value then, Java String.substring function will return the substring starting from the Starting_index to End_index. The Java string.substring method is used to extract the part of a string and return in new string. 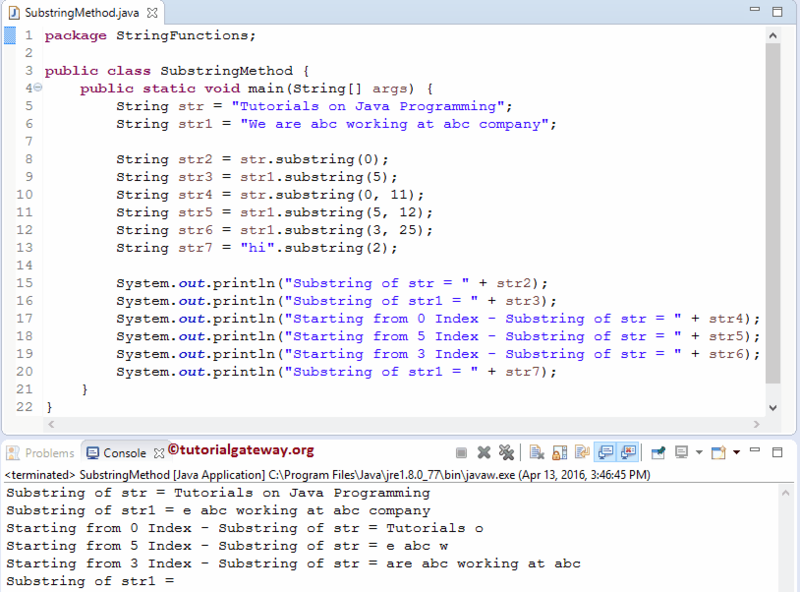 This Java program will help you to understand the Java string.substring method.